United has become the latest airline to tweak the way it calls passengers to board its planes. In a change that’s rolling out to United gates nationwide on Tuesday, the carrier says it’s streamlining its boarding process. With that, United joins American and Delta in making changes to the boarding call since early 2017. Gone are the five boarding lines used in the previous process. In is a new two-lane, color-coded process that will handle a staggered boarding call. When it’s time to board, United will call pre-boarding that’s open to its top-tier “Premier 1K” and “Global Services” frequent-flyers, active military and families with children aged 2 and under. They’ll board via lane 1. Next comes Group 1, which includes first- and business-class customers plus Platinum- and Gold-level frequent-flyers. Group 1 also boards through lane 1, while Group 2 lines up in lane 2. Group 2 boards once the Group 1 queue clears. Who is in Group 2? 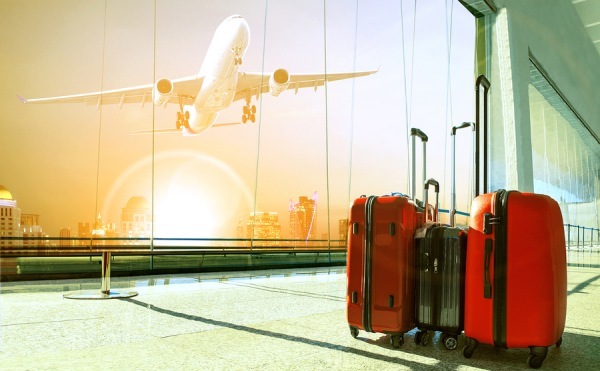 Silver-level frequent-fliers and certain United credit-card holders and customers who’ve purchased United’s priority access or boarding privileges. Travelers in Groups 3, 4 and 5 will be asked to remain seated while the first two groups line-up and board. After Group 1 and Group 2 have boarded, Groups 3 through 5 will board through the green-colored Lane 2. They’ll be called by number, starting with 3 and ending at 5. Group 5 will include most Basic Economy customers. 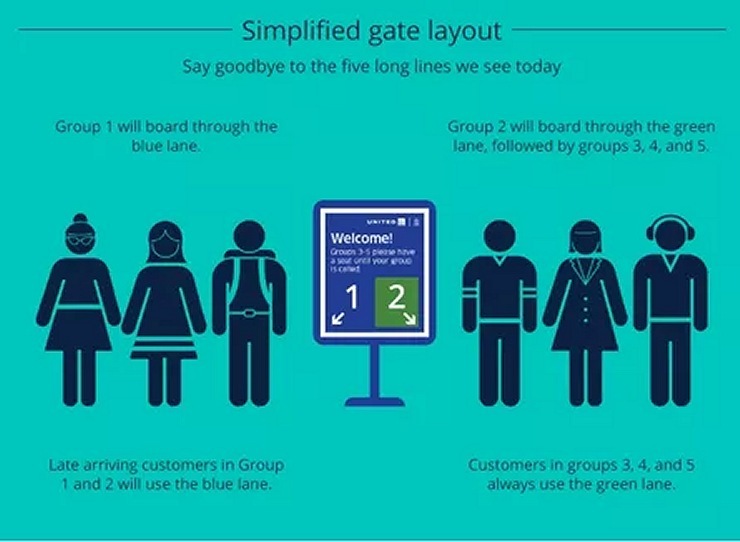 Members of Group 1 and 2 who are still arriving to the gate area will priority board via the blue-colored Lane 1. United says it’s implementing the boarding change after “testing a variety of boarding concepts” since last fall. The new system has been in affect at Los Angeles International Airport since February and will now roll out to all United locations beginning Tuesday. United’s changes hint at the struggle airlines have had in creating a boarding process that doesn’t stress out customers. Even with precisely delineated groups and queues, many travelers still feel compelled to stand in line to hold their spot. Both American and Delta rolled out similar changes in early 2017. Southwest, of course, has its own type of system since it has no assigned seats. It calls for fliers in its “A” group to line up at their corresponding pillars, which display numbers indicating where passengers where should stand. As the “A” group boards, Southwest repeats the process for the “B” and “C” groups until all passengers have boarded. That system, enacted in 2007, was meant to address crowding in the gate areas as customers queued up to be first on the plane. The move didn’t eliminate pre-boarding line-ups, but it did add order to the process.